Comedian Ron “Tater Salad” White is bringing his classic storytelling style to Netflix in his debut Original stand-up special, Ron White: If You Quit Listening, I’ll Shut Up. A founding member of the Blue Collar Comedy Tour, Ron sticks to his signature style with a cigar in hand and a glass of tequila. 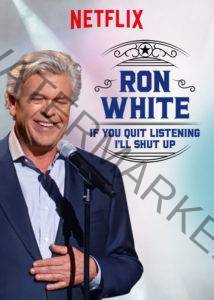 Ron, with more than 30 years of experience in comedy, talks about everything from how to avoid embarrassment as a bedwetter to building a net to keep out radical terrorist Canadian geese.Visit Ron White: If You Quit Listening, I’ll Shut Up on Netflix. If you like what read about Ron White: If You Quit Listening, I’ll Shut Up, please remember to share Netflix New Releases on Facebook, Twitter or wherever you guys want it’s all appreciated.